The Australian Network for Plant Conservation is collating a list of 200-300 plant species considered most useful in restoration projects across NSW on behalf of the Royal Botanic Gardens and Domain Trust (RBG&DT). The results from this initial project will be used to guide the development of a broader RBG&DT project - Restore and Renew NSW. 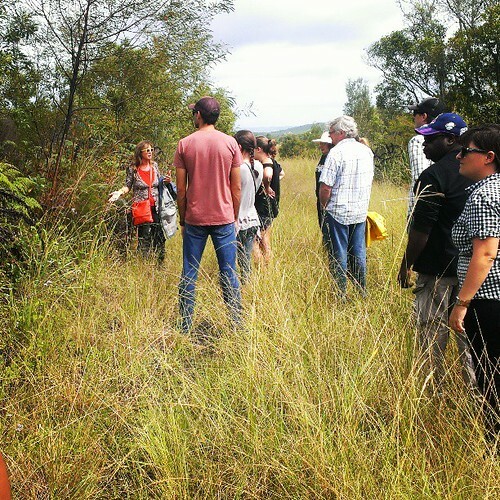 The initial stage of this project is an online survey targeted at anyone involved in native vegetation restoration projects in NSW, including: restoration practitioners, bush regenerators, community volunteers, growers, seed collectors, regulators, licensors and researchers. 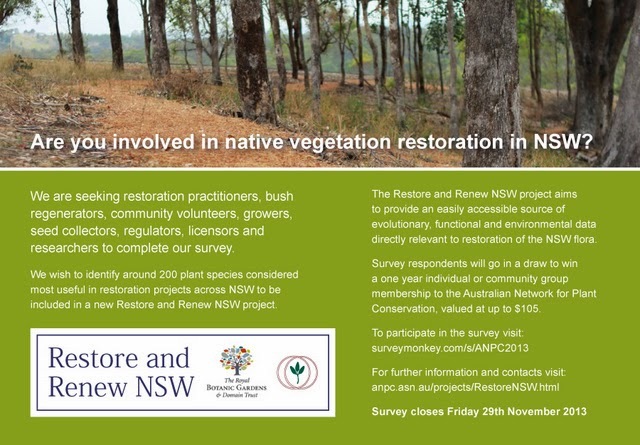 We invite anyone involved in native vegetation restoration in NSW to participate in this survey: https://www.surveymonkey.com/s/ANPC2013. Further information on the content and objectives of the survey is provided in the survey introduction. Survey respondents will go in a draw to win a one year individual or community group membership to the ANPC, valued at up to $105. Survey closes Friday 29th November 2013. The Restore and Renew NSW project aims to create a website where practitioners can access genetic, environmental and ecological information (including seed storage and germination requirements) for around 200 plant species. 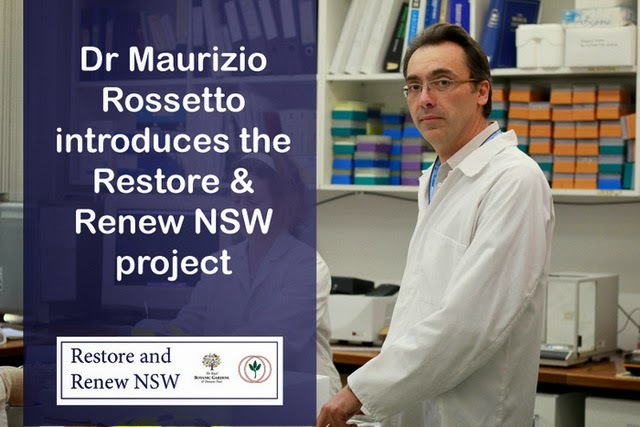 Click on the image above to view a brief video about the Restore and Renew NSW Project. More information on the vision for the Restore and Renew NSW project, and how to become involved, can be found here. Restore & Renew NSW: New provenance guidelines for ecological restoration. This seminar is being held in partnership with the Australian Association of Bush Regeneration (AABR) and Royal Botanic Gardens and Domain Trust. For more information and to register visit the AABR website. 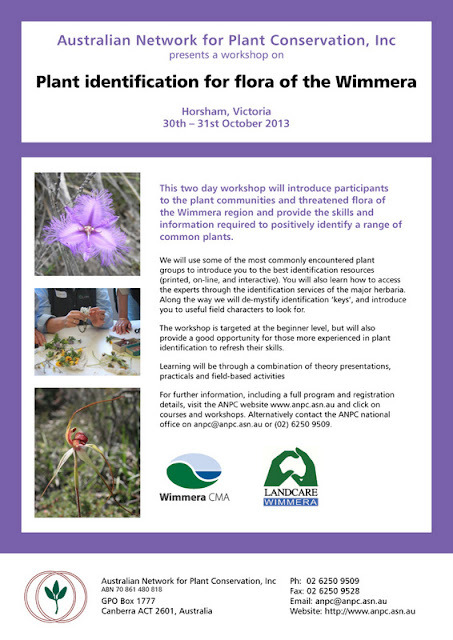 Only two weeks until our workshop on plant identification for flora of the Wimmera. Registrations close 23rd October. 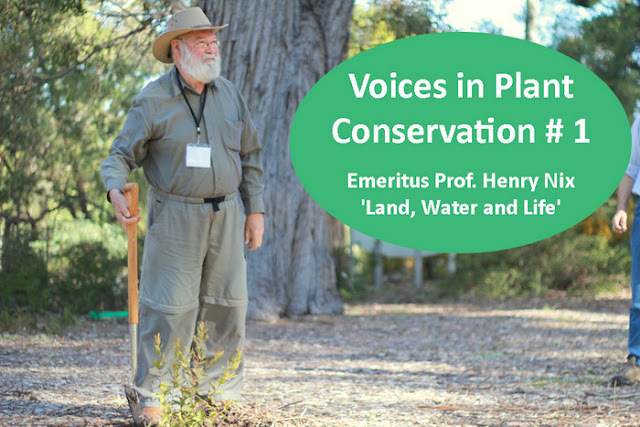 This two day workshop will introduce participants to the plant communities and threatened flora of the Wimmera region and provide the skills and information required to positively identify a range of common plants. 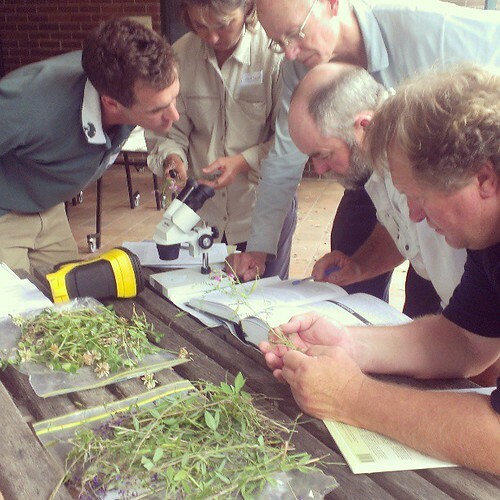 While the workshop focuses on flora of the Wimmera region, the skills learnt are transferable to other regions, making this course suitable for anyone wanting to improve their plant identification sills. More information, including fees and registration form. Join ANPC and receive free membership for the rest of 2013, as well as one extra edition of our quarterly bulletin 'Australasian Plant Conservation'. Offer open until end of December. Become part of a thriving network of plant conservationists which will help you keep in touch with news, activities, contacts and information on plant conservation in Australia and overseas. * Four issues a year of the bulletin Australasian Plant Conservation. * Discounted subscription to the journal Ecological Management and Restoration (EMR). 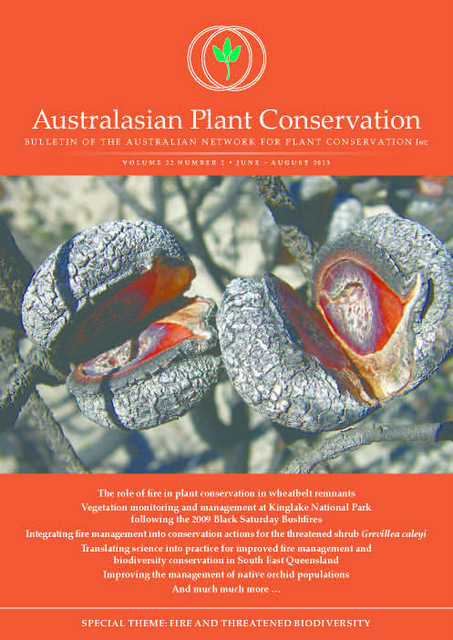 We are seeking articles for the December 2013 – February 2014 issue of Australasian Plant Conservation (APC), the bulletin of the Australian Network for Plant Conservation. The issue will be on the theme of "Seeds". This issue will focus on the topic of seeds; everything from dispersal, germination and dormancy, longevity and storage, seed banking, use of seed in revegetation and conservation. Share your findings with our readers! details of relevant publications, information resources and websites. Deadline for submissions for the issue is Friday 8 November 2013. If you are intending to submit an article or wish to discuss possibilities, please contact the Editor, Selga Harrington, by 25 October. Your final article must be submitted to Selga by email at selga (dot) harrington (at) gmail (dot) com. The ANPC’s 10th national conference will be held in Hobart, Tasmania in the first week of November 2014. ANPC national conferences provide a major forum for conservation practitioners, community members and the scientific community to interact at a practical level. Further details will be provided at anpc.asn.au/conferences.html as they become available. If you are involved in flora conservation and/or flora translocations in Australia, you are invited and encouraged to participate in an on-line survey being conducted by the NSW Adaptation Research Hub of Macquarie University. This study will provide the NSW Government Office of Environment and Heritage (OEH) with an overview of the role of flora translocations under climate change and an update on flora translocations in Australia, using case study evidence to inform practice. Survey results will be published in a peer-reviewed journal and will be made available to the wider community upon request. The survey closes at 5 pm on Friday 25th October 2013. More information and a link to the survey can be found here. Sydney Weeds Professional Forum incl. techniques for Weed Management in Environmentally Sensitive Areas, Sydney, NSW, 18 Oct.
Hunter Valley endangered species walk through Lower Hunter Dry Rainforest NSW, habitat for Cynanchum elegans 9th Nov.
International Biogeography Society Early Career Conference 7-10 Jan 2014 Canberra. ANPC's 10th National Conference, Hobart Tasmania, 1st week Nov 2014.
social activities to facilitate networking among all stakeholders in plant conservation. 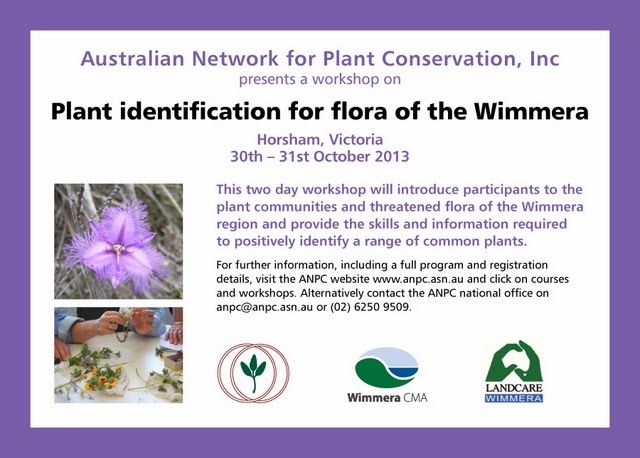 ANPC will be hosting a workshop on plant identification for flora of the Wimmera in partnership with Wimmera CMA and Wimmera Landcare 30th – 31st October 2013 in Horsham. ANPC recently welcomed our new Office Administrator Carly Westbye. Carly's background is graphic arts and desktop publishing. She has worked in both the public and private sector. Carly is looking forward to sharing her skills and knowledge in the print and publishing industry, along with providing administrative support for the production of workshops and general office duties. Carly will be working Monday - Wednesday in the Canberra office and can be contacted on admin (at) anpc.asn.au or (02) 6250 9509. Patch Protection II: A new project by Greening Australia will investigate effective management of fenced woodland remnants. The South Australian collaborative project Nature Links is a finalist in Banksia Sustainability Awards. THE MATRIX IN ECOLOGY (watch) by Don Driscoll - a great example of disseminating research findings. Four ecosystems added this month to EPBC Act list of threatened ecological communities. The Red List of Ecosystems: a new approach to conservation. An article by David Salt in ECOS Magazine. Increasing the resilience of the Australian alpine flora to climate change and associated threats: A plant functional traits approach. A report by National Climate Change Adaptation Research Facility. Genetic research assists in a Seed Production Area project (watch). A collaborative project between Greening Australia, Australian National Botanic Gardens, and CSIRO. A list of 'Top 20 Oz ecology blogs' collated by Ian Lunt. Obligate Seeding Proteaceae & Kwongan of the Esperance Sandplains. Feral Herald - New Official Blog of the Invasive Species Council. Terrestrial Report Card 2013 - summarising knowledge on climate change impacts in Australian terrestrial and freshwater systems, and identifying knowledge gaps & adaptation responses. S2S Bioblitz Woomargama NSW 6-8th Sept 2013. Bushcare's Major Day Out, 8th September. National. Best Practice Ecological Rehabilitation of Mined Lands Conference, Singleton NSW 11 Sept.
NSW Weeds Conference, Corowa (Murray River region), NSW 9-12th Sept.
Queensland State Landcare Conference: 'Healthy habitats profitable production', Warwick QLD, 27-29 Sept.
Australian Association of Bush Regeneration NSW Relaunch & Seminar Day Sydney 3 Oct.
31st NSW Environmental Education Conference Dubbo NSW, Sept 26-28. ANPC is seeking articles for the Sept – Nov 2013 issue of our quarterly bulletin Australasian Plant Conservation (APC). The issue will be on the theme of "The value of plant conservation to animals”. The ecology and survival of plants and animals is interdependent. From pollination, to grazing, to provision of habitat resources, interactions between plants and animals underpin ecosystem functions. In this issue we are examining key interactions of plants and animals and the value of plant conservation to animals. Articles can range from overviews of some/all of the interactions to case studies illustrating particular examples. We also welcome: book reviews; interesting recent publications or resources; conference, workshop, course and fieldwork announcements; and details of relevant publications, information resources and websites. Deadline for submissions is Friday 12 August 2013. Guidelines for authors about the APC style and scope can be found here. If you are intending to submit an article or wish to discuss possibilities, please contact the Editor, Selga Harrington, by 30 July. Your final article must be submitted to Selga by email at selga.harrington (at) gmail (dot) com. ANPC is seeking book reviewers. Reviewers get to keep the book! Reviews will appear in ANPCs quarterly bulletin Australasian Plant Conservation (APC). * Australian Rainforest Fruits, a field guide, by Wendy and William Cooper. Email expressions of interest to Australiasian Plant Conservation editor selga.harrington (at) gmail (dot) com. ANPC members recently received the latest edition of Australasian Plant Conservation (APC). The theme of this issue is fire and biodiversity. *Integrating fire management into conservation actions for a threatened plant. *Translating science into practice for improved fire management and biodiversity conservation. *The response of threatened orchids Victoria to wild fire. *Improving the management of native orchid populations. *The role of fire in plant conservation in wheatbelt remnants. *Identifying ecosystems at risk – the new IUCN Red List. There’s also loads of regular features including: Report from New Zealand Plant Conservation Network (NZPCN) , Recent ANPC workshop reports, Upcoming conferences and workshops, Information resources and useful websites, and a Research round up. If you would like to receive APC become a member of ANPC. Biodiversity Fund slashed. c. $200 Million of unallocated funding from the Biodiversity Fund was returned to the budget. Federal Government release list of 15 Strategic Research Priorities including three related to living in a changing environment. These priorities will guide investment in research. "Repairing and preparing Australia's landscapes for global change: Why we must do much more". A new report from Australia 21. Related read. First outbreak of Red Witchweed (Striga asiatica) in Australia recently confirmed in Queensland. Red Witchweed parasitises a very wide range of hosts in the Poaceae, so has the potential to pose a serious threat to sugarcane and cereal crops. More information and reporting procedures. News story. Why grasslands need 'champions', John Morgan. Highlights (video) from a Native Seed Production Area Workshop run by Greening Australia and Australian National Botanic Gardens. Nature Hub: a new website for organisations, groups and individuals working in the volunteer conservation sector in Southern Tasmania. Weedfutures: a new Australian weed website providing a decision support tool to help determine current and future weed threats. Landcare social media manual. Landcare Australia recently launched a social media manual to help groups get the most out of Facebook, Twitter and YouTube. The manual is for members of the Landcare community who are thinking about starting to use social media, or who have been using it for a while but would like to learn more. Also be useful for other organisations and groups. Carbon Farming Initiative webinar on how to conduct an environmental planting project. Wet Tropics World Heritage Area - e Bulletin. The Wet Tropics Management Authority recently launched a Learning Landscape eBulletin that showcases current and emerging Wet Tropics research and related land management and policy issues. Identification of vegetation communities of Western Sydney. 3 days August 2013 Richmond, NSW. Australian Mine Rehabilitation Workshop 6-8 Aug 2013 Adelaide, SA. Bushcare's Major Day Out, 8th September 2013. National. 31st NSW Environmental Education Conference Sept 26-28, Dubbo NSW. There appears to have been a problem with the scheduling of ANPC News and it accidentally went out this morning with only the last item. Sorry. It is important to us that we do not fill your email in box with too many messages, so I apologise for unintentionally sending you two emails today. We would love to help promote your events, research outcomes or activities. 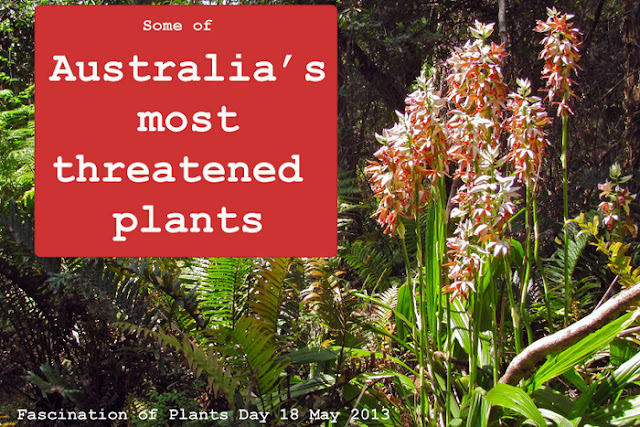 ANPC celebrated Fascination of Plants Day 2013 by launching a slide show of some of Australia's most threatened plants. The slide show depicts just a few of the hundreds of Australian plant species facing extinction and highlights the diversity of threats facing our flora and the range of recovery actions being implemented. Click on the image above to view the slide show. The goal of fascination of Plants Day was to get as many people as possible around the world fascinated by plants and enthused about the importance of plant science for agriculture, in sustainably producing food, as well as for horticulture, forestry, and environmental conservation. Thank you to all who responded to our request for images. ANPC recently welcomed our new Business Manager, Jo Lynch. Jo is replacing Merryl Bradley who will be retiring 30th June. 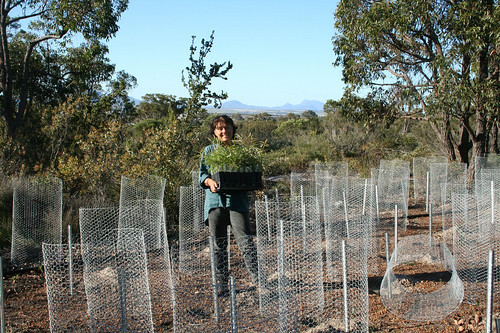 Jo’s background is in bush regeneration and noxious weed management in the Sydney region. She moved to Canberra 5 years ago where she has since been working on the challenge of raising two children. Jo is thrilled to be joining the ANPC and will be working on increasing the organisation’s profile and funding through grants, donations and sponsorships, as well as a few other new ideas. Her vision is for the ANPC to grow in size and influence to equal other national environmental organisations. Jo will be working Thursdays and Fridays in the Canberra office. If you have any fundraising or promotional ideas, please feel free to contact her on (02) 6250 9523, 0438 775823 or via email: anpc (at) anpc.asn.au. As we near the end of the financial year it is a good time to remind you that all donations to the ANPC over $2 are tax deductible. Established in 1991, we are the only national, non-profit, non-government organisation focused primarily on Australian plant conservation. Funds donated to ANPC are used to assist us in our mission to promote and improve plant conservation in Australia. To join other donors and support the work of the ANPC find out how to donate here. NSW Government announces significant changes to Native Vegetation regulation. Summary pdf. This is the first stage in a major review that will include revision of the Native Vegetation Act 2003, the Threatened Species Conservation Act 1995, and related biodiversity legislation. (View ANPC’s submission to NSW Native Vegetation Regulation Review - no 241). Victorian Government releases details of changes to native vegetation clearing regulations. Public feedback on the White Paper – A new planning system for NSW due 28th June 2013. Submission Guides prepared by Environmental Defenders Office NSW and Nature Conservation Council of NSW. Biodiversity offsets could be locking in species decline (& at worst may provide an incentive for decline to continue), The Conversation. New model to save farm biodiversity: Farmers paid to conserve biodiversity hotspots in Tasmania. 'Our national parks must be more than playgrounds or paddocks', The Conversation. Supreme Court action launched against Vic state government over failure to prepare recovery plans. New Eucalypt ID resource: Atlas of Leaf Venation and Oil Gland Patterns in the Eucalypts. Weed Futures: an online decision support tool that provides users with the ability to search weed profiles and assess emerging weed threats for regions or management units of interest. Australian Policy Online is a research database and alert service providing free access to full text research reports and papers, statistics and other resources essential for public policy development and implementation in Australia and New Zealand. The site specialises in reports and articles (grey literature) on public interest issues, including the environment. Examples of recent reports shared relevant to the conservation of native vegetation include: identifying climate change refugia, increasing the resilience of the Australian alpine flora to climate change, designing landscapes for biodiversity under climate change, and protecting and restoring habitat to help Australia’s threatened species adapt to climate change. The Wet Tropics Management Authority recently launched a Learning Landscape eBulletin that showcases current and emerging Wet Tropics research and related land management and policy issues. 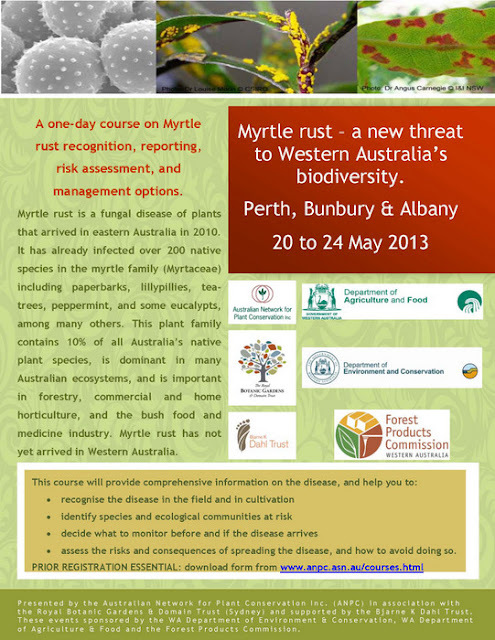 Registration is open for upcoming ANPC workshops on Myrtle Rust. This one day workshop to be held at various locations in Western Australia will provide training in Myrtle Rust recognition, reporting, risk assessment, and management concepts and techniques. These one-day events will present a comprehensive summary of what is known of this new threat to Australia’s biodiversity, the knowledge gaps, and management options. The emphasis will be on wild-plant conservation, but there will also be information relevant for people from the horticulture, forestry, and bush-products sectors who wish to know more about Myrtle Rust, how to monitor for it, and where to find information on the control measures available for horticultural sites and suppliers. The day will also include workshop sessions to assist you to think about regional priorities, and options for changes to work practices for your sector. assess the risks and consequences of spreading the disease, and how to avoid doing so. The ANPC is seeking images of Australian threatened flora and communities for a slide show on 'Some of Australia's most threatened plants'. The slide show will be launched online 18 May 2013 as part of Fascination of Plants Day. Images can be habitat shots, close-ups, or of someone doing something (e.g. seed collecting, monitoring or planting). The slide show will be similar in style to one we released last year for Threatened Species Day. Preference will be given to critically endangered and endangered entities. Images need to be original high resolution and be accompanied by information (less than 150 words) on the species or community pictured, status, threats to its survival, and what is being done to conserve it. Photographer credits will be included so please include photographer name. Please email images and information to projects (at) anpc.asn.au by 5pm Wed 8th May. We'll upload the final slide show to the ANPC website by Wed 15th May ready to promote via social media on World Fascination of Plants Day 18 May. Here's a list of all Australian World Fascination of Plants Day events. Image credit: Banksia brownii, one of the species included in a previous slideshow on 21 of Australia's most threatened plants. Photographer: Sarah Barrett. We are seeking articles for the June – August 2013 issue of Australasian Plant Conservation (APC), the bulletin of the ANPC. The issue will be on the theme ‘Fire and threatened biodiversity’. Fire is a major tool available for land management and can be used to protect property from wildfire, protect fire sensitive habitats, maximise biodiversity and manage woody weeds. Although fire is an important management tool, there are many gaps in our knowledge of how and how often it can and should be used. We wish to explore the use of fire for plant conservation, in particular for threatened species and ecological community management. Articles can range from overviews of the use of fire as a management tool, to case studies illustrating particular examples. Further guidelines can be found here. · details of relevant publications, information resources and websites. Deadline for submissions Friday 10th May. We've been sharing plant conservation news and articles of interest almost daily through our social media channels Twitter, Facebook and Google +. We're now also sharing images of our events and activities via Instagram. Funding opportunity for community groups helping to conserve threatened ecosystems: Australian Ethical community grants. Long-term planting experiment investigating cost-benefit trade-off between biodiversity & carbon. 'Carbon plantings will only have real biodiversity value if they comprise appropriate native tree species'. Caring for our Country Community Environment Grants close 8 May. PhD & Post Doc positions available studying lineage diversification in New Zealand plants. Close 1 May. Response of grassland to stock exclusion - Ian Lunt provides a great overview of a recent study. NSW Government today released the White Paper – A new planning system for NSW. Public feedback invited. Australian soil databases can be accessed through SoilMapp iPad app - provides soil info for any location. Uncertainty re value of fire for managing grasslands that have long history of fire exclusion & grazing (John Morgan claims this is 'the best paper of the year!'). Which of our forests should be managed for carbon? Funding opportunity: Foundation for National Parks & Wildlife for field & education projects. Current round due 3rd May. All of the presentations from the TERN 2013 Symposium are now available online. EcoArts Conference 12-13 May 2013 Wollongong NSW. Fungimap conference, Vic, 23-27 May. Fascination of plants Day 18 May. Here's a list of Australian events. Bushfire Conference: Fire & Healthy Landscapes: resilient environment, resilient people, 4-5 June 2013, Sydney NSW. Includes a symposium on using fire for restoration. Big Science Communications Summit: Pathways to inspiring Australia 6 & 7th June 2013 Sydney. 31st NSW Environmental Education Conference Sept 2013. If you have plant conservation news you would like us to share please email your news to anpc (at) anpc.asn.au. Please include "For ANPC News" in the subject. Participants will gain hands-on experience in developing a collection strategy, seed cleaning, seed viability testing, and hygiene to minimise Phytophthora and Myrtle Rust spread. You can also view a report from a recent similar workshop held in Sydney last year. This successful workshop has now been delivered 15 times across Australia and internationally. The workshop will include case studies of translocation programs, highlighting lessons to be learnt and an optional full-day field trip to translocation recipient sites for a range of threatened plants and a tour of the Brisbane Botanic Gardens Seed Bank. 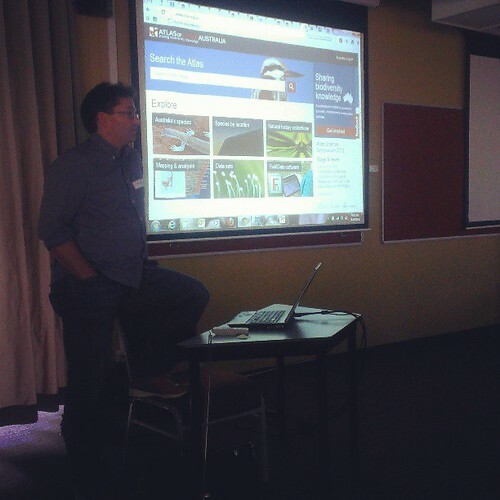 You can also view images and reports from similar workshops held last year in Canberra and Sydney. How have you used fire to manage threatened ecological communities, threatened species or their habitats? What was achieved, what were the strengths and weaknesses, and lessons learnt? Do you have insights on the effects of fire on a threatened species and lessons on how fire could be used in their management? Articles generally should not exceed 1200 words and authors are encouraged to submit two or three high resolution images to illustrate their article. Further guidelines can be found here. Deadline for submissions is Friday 10 May 2012. If you are intending to submit an article or wish to discuss possibilities, please contact the Editor, Selga Harrington (selga.harrington (at) gmail.com, by 26 April. ANPC donors were recently thanked for their support. The ANPC and its Public Fund was entered on the Register of Environmental Organisations and became entitled to receive tax deductible donations in July of 2007. People who donate to the ANPC Public Fund can claim that donation as a tax deduction. Since the establishment of the Public Fund the ANPC has received 71 donations totalling over $3,000. Last year, the ANPC committee decided to use part of those funds to purchase a laptop and litepro for use at our workshops and conferences. The equipment has already been used at a number of workshops and at our recent 9th National Conference. Peter Doherty of CSIRO giving an overview of the Atlas of Living Australia at a recent workshop using the laptop purchased with donated funds. Every small donation will enable us to purchase equipment or services to help us fulfill our mission to promote and improve plant conservation. Donations are tax deductible. More information on how to donate to the ANPC can be found here. Lowland Grassy Woodland in the South East Corner Bioregion - New EPBC Act critically endangered listing. ANPC Committee member Noushka Reiter on translocation of endangered orchids. Horticulture Crops Conservation Officer assignment available with Australian Red Cross. Help conserve Bhutan's crop diversity. Research suggests land managers reintroduce native flora to safeguard against effects of fire and climate change. Do environmental impact assessments protect Australia's environment. What is killing gum trees in the high country? Charles Darwin University investigating how biodiversity conservation may generate income for NT pastoralists (listen). Australia’s tropical savannas are largest least-degraded on Earth. Sadly they are threatened by Gamba Grass. Private land managed by NGOs is an important piece of the conservation jigsaw. New theory: 'forests are the heart of the earth, driving atmospheric pressure, pumping wind & moving rain'. New population of Critically Endangered plant Spiny Daisy discovered. AusPlots-Rangelands Survey Protocols Manual & app launched. Notes from 2013 Terrestrial Ecosystems Research Network (TERN) Symposium. Useful decision support tool for assessing genetic risk in revegetation. The Weeds of Australia identification tool. Integrated conservation of tree species by botanic gardens – a reference manual. Impact! - a journal of environmental law published by NSW EDO is now available online for free. NEW BOOK: Eucalypts of Western Australia's Wheatbelt. NEW BOOK: Ecological Restoration and Environmental Change: Renewing Damaged Ecosystems. The Australian Invasive Cacti Network now has a website and forum. Seed collection, storage and use for native vegetation restoration workshop, 3 April 2013, University of the Sunshine Coast, Sippy Downs, Qld. 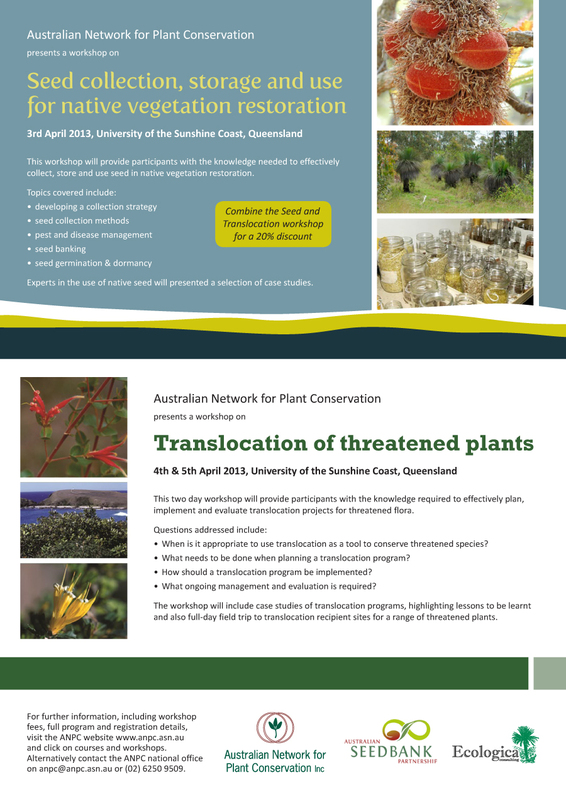 Translocation of threatened plants workshop 4 & 5 April 2013, University of the Sunshine Coast, Sippy Downs, Qld. Bushfire Conference: Fire & Healthy Landscapes: resilient environment, resilient people , 4-5 June 2013, Sydney NSW. Includes a symposium on using fire for restoration. Republishing because the video link didn't show up in yesterdays email. Over the coming months we’ll be sharing audio and presentation slides from ANPC’s 9th National conference. First up is Henry Nix's plenary presentation on 'Land, Water and Life'. Click on the image below or here and press play. In 2012 the ANPC celebrated 21 years promoting and developing plant conservation. 21 people, each representing many more active ANPC members, each planted a Eucalypt at the gardens. Click on the image below or here to view all 21 planters. Click on 'show info' in the top right to see a description for each image. 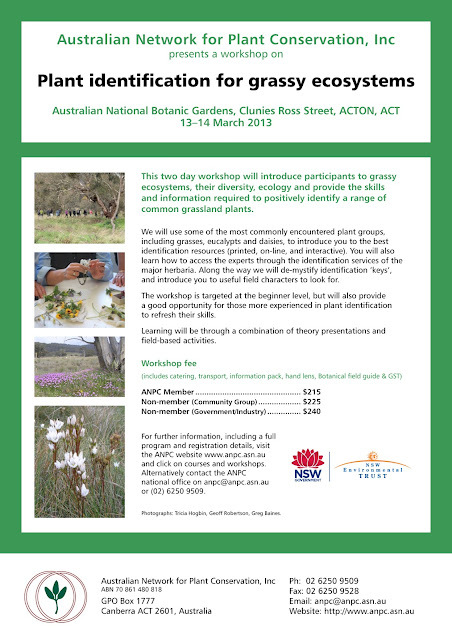 This two day workshop will introduce participants to grassy ecosystems, their diversity, ecology and provide the skills and information required to positively identify a range of common grassland plants. We will use some of the most commonly encountered plant groups, including grasses, eucalypts and daisies, to introduce you to the best identification resources (printed, on-line, and interactive). You will also learn how to access the experts through the identification services of the major herbaria. Along the way we will de-mystify identification ‘keys’, and introduce you to useful field characters to look for. For more information, including a flyer and registration form please visit the workshop webpage. You can also view images and a report from a recent similar workshop held in Deniliquin last year. Lets not leave the NSW environment defenseless. Support @EDONSW. Watch & act. Trash to Treasure: Restored landfills provide new habitat for flowers and insects. WA farmers seek funds to pay for the protection of bush on agricultural properties. Inspiring work by Trust for Nature Victoria protecting and restoring 30,000 ha native vegetation. Efforts to restore threatened woodlands across NSW and ACT featured on ABC news. Is the tide turning on using locally collected seed for restoration? Should we care less about local provenance? Livestock grazing may be useful tool to achieve conservation objectives in SOME ecosystems at SOME times. Australian student John Gould discuses impact of carbon forestry on biodiversity.